CIRCA 1920 - As cans of milk enter a dairy receiving plant, their lids are loosened by machine and their temperatures checked by men. hd01:27CIRCA 1954 - Students from the Fort Wayne New Vehicles Training School in Detroit study the weaponry and construction of the M48 tank. 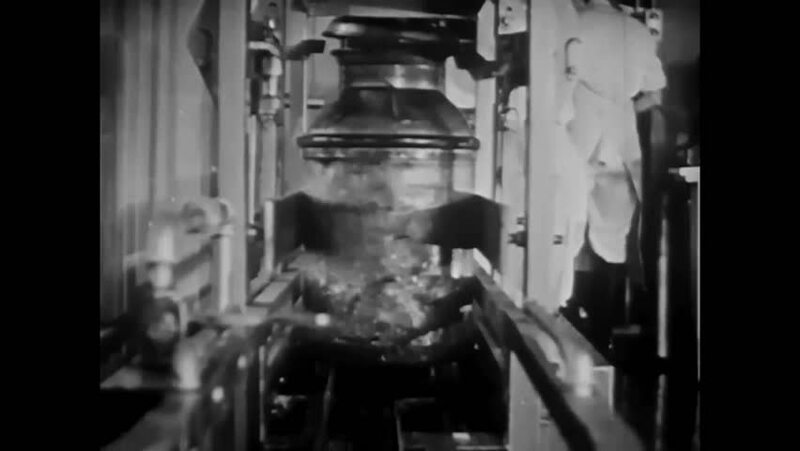 hd01:01CIRCA 1920s - A grinding transformer die and the machining of a stel plate for a drill jig are shown in a radio-building factory, in Long Island, New York, in 1925.
hd00:16Two scientists operate a robotic arm, via remote control, to work with atomic materials in a testing chamber. hd02:21CIRCA 1920s - The workings of a steel mill in the 1920s. hd01:40CIRCA 1940s - Contralto Eula Beal performs None But the Lonely Heart, with piano accompaniment. hd01:02CIRCA 1920s - Punch presses are used to cut and to form metal parts, including audio transformer parts, in a radio-building factory, in Long Island, New York, in 1925.
hd01:15CIRCA 1944 - The production of plastics increased exponentially during WWII as it was used in most equipment and machinery. hd00:31CIRCA 1940s - A time projector measures a watchs accuracy and watches are produced at the Hamilton Watch Factory in the 1940s.